tl;dr: Our experts provide answers to five common challenges enterprise IT leaders face when monitoring multi-cloud environments. These problems include: constant change, siloed cloud vendor tools, no support with legacy tools, difficulty in selecting multi-cloud monitoring tools, and training staff. Late last year, an article in Network Computing spelled out several challenges enterprise IT leaders face when monitoring multi-cloud environments. We decided to make lemonade from those lemons. The article identified the challenges; now we share viable solutions to real-life multi-cloud monitoring challenges. How on earth can enterprise IT teams instrument multi-cloud environments when changes occur so quickly – practically every minute of the day? Answer: Instrument your multi-cloud environment to be as elastic as the cloud is. The cloud’s advantages are clear – scale and flexibility, speed and cost savings. To get the most from your multi-cloud architectures, you must maintain performance across the environment. 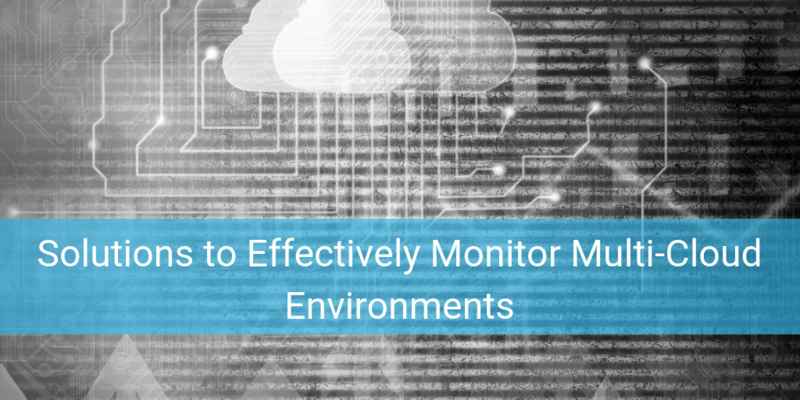 One way IT teams keep it all running smoothly is to deploy a monitoring solution that’s as dynamic as your cloud – designing an environment that feeds relevant data back to your existing teams and tools just as quickly as the environment itself changes. Adding a flexible monitoring solution to multi-cloud environments limits complexities and enhances workload security and performance. Most cloud tools only monitor and manage workloads running on that one vendor’s infrastructure. This siloed approach results in an obvious drawback to any multi-cloud environment. Answer: Instrument each public cloud with an agnostic system that can capture packet level data from any cloud. Packets are packets whether they come from Microsoft Azure, AWS, Google Cloud or any other public cloud platform. Containers, for example, help eliminate issues when migrating from one cloud service provider to another. You create the specifications important to your environment and then deploy the container(s) needed, which can be run almost everywhere. Creating an agnostic system results in a huge business benefit – you’re operating a multi-cloud environment that provides agility and time-to-market advantages. As the Network Computing article points out, “Most organizations already have monitoring tools that they use for their in-house data centers.” With this investment already made, it makes sense that IT teams would want to extend the use of these tools in their cloud platforms. Sadly, though, data center-centric tools aren’t built for cloud monitoring and cloud providers only serve up the basic details (logs, etc.) that don’t cut the mustard at the enterprise IT level. Answer: Replicate and process packet level traffic from virtual machines and containers in any public cloud and send that processed packet feed to the teams and tools of your choosing – both in-cloud and on-premises. That’s what Nubeva Prisms enables today. Your IT team can activate and run the tools they choose and gain the critical visibility and control they need. Nubeva Prisms is a cloud-native solution that is built on container technology, which means full elasticity with no added complexity. If you’ve sought out and priced multi-cloud monitoring tools, you know the cost can be eye-opening. Now multiply the cost across the cloud platforms you’re using or will use (according to Enterprise Strategy Group, 81% of organizations already use two or more cloud providers and 51% use three or more). Who’s signing off on that line item in your IT budget? Answer: Don't solve this problem. Dissolve this problem. Your IT team doesn't need another tool. Instead, extend the effective lifetime (and by extension, your ROI) in your existing investments by feeding them with packet traffic from the cloud. Cloud native sensors and agents like Nubeva Prisms enable teams to aggregate and filter packet traffic using elastic processing services. This minimizes the impact on IT resources and allows use of legacy tools in private datacenters for maximum flexibility and investment protection. As multi-cloud monitoring tools are implemented, those on the IT team have to be properly trained in using the tools. This means team and expense for training. What’s more, the labor market is tight, so IT leaders can’t afford to train their experts only to have them poached by a competitor. Answer: Apply a standard approach to the tools used in your multi-cloud environment. It might be obvious, but we have to say it; don’t run one set of tools in your data center and an entirely separate, new set in the cloud. Instead, adopt a best-of-breed approach to the tools your IT team has at its disposal. Deploy and maximize the tools that deliver real-time visibility across your entire network environment. When teams have access to familiar tools they know and understand, their ability to effectively monitoring a multi-cloud environment is simplified – and the likelihood of mistakes is reduced dramatically.